Quince Spoon Sweet (Preserves). Photo © N. Gaifyllia, licensed to About.com, Inc.
Quinces are the perfect fruit for cooking. 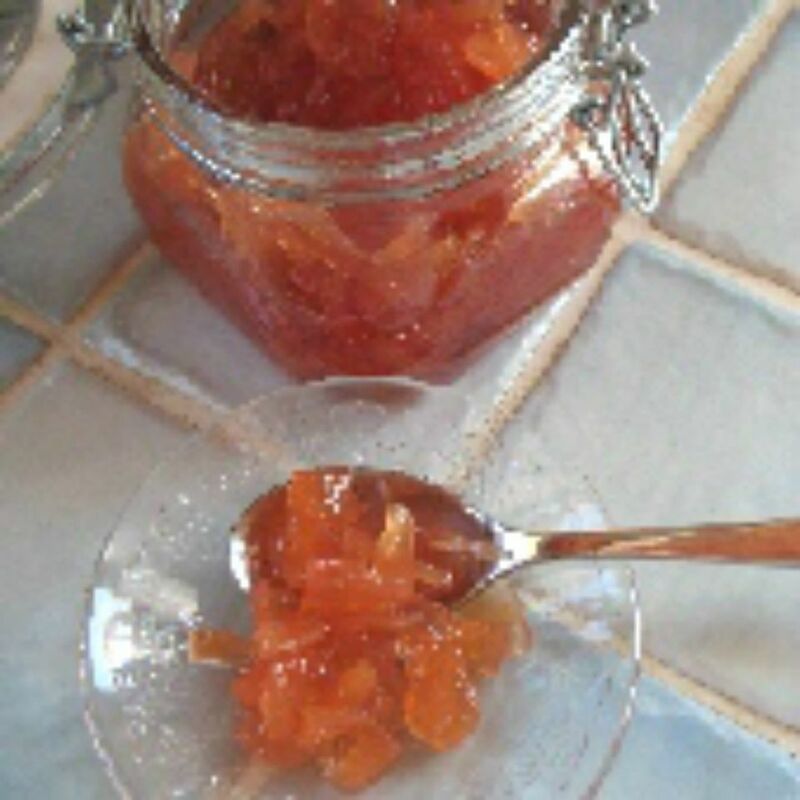 In Greece, we cook them with meats, alone (similar to baked apples), and make them into marmalade and this delicious and colorful spoon sweet (preserves, served by the spoonful), with a sugar syrup. The recipe calls for 2 parts peeled, seeded quince (by weight) to 1 part sugar. This recipe will make 6-7 cups. To make more, increase quantities. Because the quince pulp turns dark once cut open, work with small slices, one at a time. Cut a thin slice of quince from top to bottom of the fruit (not across), about 1/3 inch wide. Remove peel and trim center, the way you would an apple. Cut the slice in half lengthwise and then into thin chunks, and put in the water, otherwise, the quince will turn dark. Continue until all quinces have been cut, peeled, and put in water. Drain in a strainer, and rinse under running water. Transfer quince to a large pot and add enough water to reach the top of the fruit. Add sugar, cover, and bring to a boil over high heat. When a full boil is reached, lower heat to medium-high, remove the cover, and cook until the syrup coats a spoon, medium drip - about 1 hour.​​ ​​​Note: The color of raw quince is similar to a pear. When it cooks, it turns a reddish color, from light to dark, depending on the recipe. Allow to cool for 30 minutes. Spoon into jars with airtight seals, and allow to cool completely before sealing.